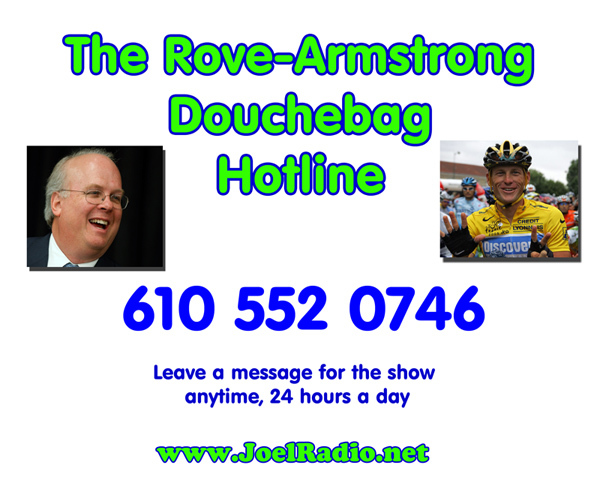 Call the Rove-Armstrong Douchebag Hotline! Sorry for taking a few weeks away. I was busy working on some other projects. Really! The plan is to do a new show the week of June 21st with Corey Hall guesting and featuring a full rundown of the E3 conference, a World Cup update, and we might even see what assholes are currently on Chat Roulette – I know a lot of you liked that segment last time. Sadly, Joel is sick, so there won’t be a new show this week. The good news is that what Joel got and how he got it is pretty funny and will make for a good story, so tune in next week for that. Laugh-A-Palooza starring Joel this weekend! 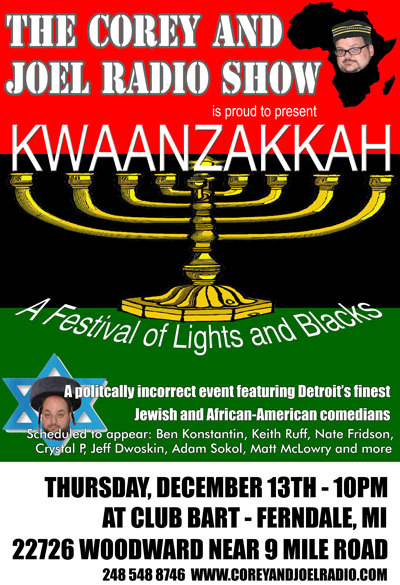 It’s a big weekend for comedy, as Joel hosts Laugh-A-Palooza at the Palace of Auburn Hills in suburban Detroit, Saturday December 19th at 7:30 PM. The show also features comedians Dan Grueter, Bill Squire, Dwayne Gill and Ben Konstantin. You can click here to download a discount coupon that will get you in for cheap, buy tickets directly here, and more info is available at the the Palacenet site right here. Joel takes the stage at 7:30 PM sharp, so don’t be late! Due to stand-up related travels, there won’t be a new Joel Radio posted this week. However, there is something cool you can listen to, and that is John Tenney’s podcast The Oddist. John’s got an interview with myself and Harry Artin Berbarian on his most recent show. It’s really funny too, with talk of conspiracies, UFOs, online dating and toothless squirrels. Here’s a direct link, with Harry and I coming in at the 42:00 minute mark. 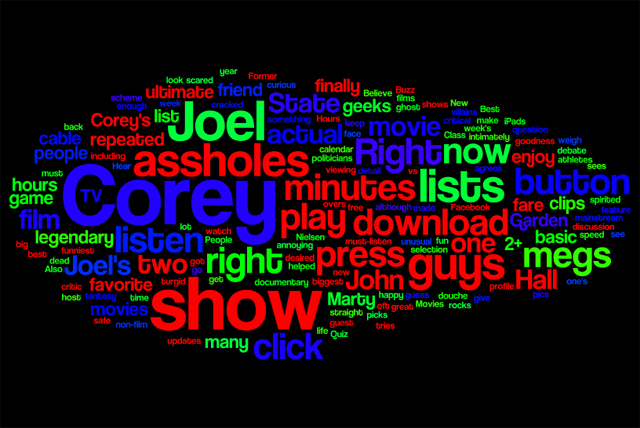 John was always a great guest on Corey and Joel Radio, so give him the ol’ reacharound and listen to The Oddist – you won’t regret it. No show this week, here’s why……. This week, I’m off once again to perform at the Gathering of the Juggalos in southern Illinois. Because I’m leaving early in the week there’s no time to produce a show, but if you haven’t listened to last week’s show with the return of Corey, it’s a must-listen, so check that out. That also means no UFC 101 picks with Steve Sabo, but we’ll be back at it for UFC 102. Also, watch the Gathering “infomercial” below. You’ll get a feel for what this crazy event is (I’m in the video for a second), and you’ll see that I’ll have some great stories for next week’s show. 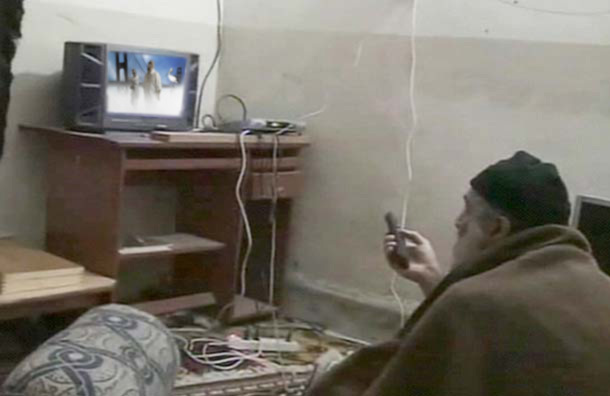 It’s a bit of a viral hit on the web already, too. It’s worth the 14 minutes, trust me! – All Star Comedy Club is located at the Thunderbowl Lanes 2400 Allen Road, Allen Park, MI.